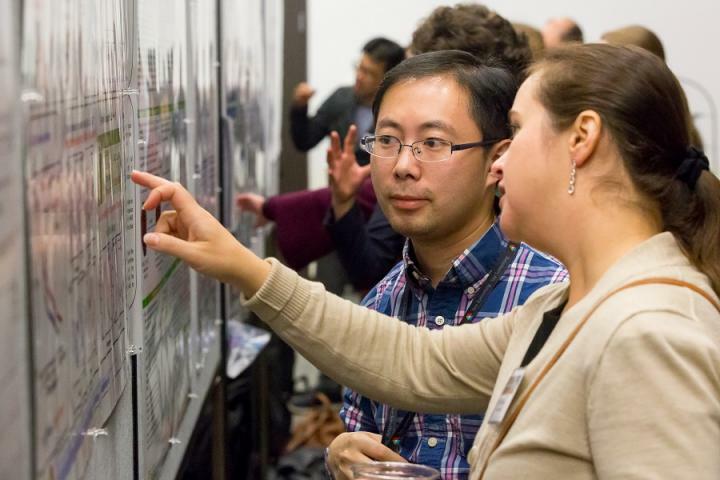 The Advanced Photon Source (APS) and Center for Nanoscale Materials (CNM), two U.S. Department of Energy (DOE) Office of Science User Facilities located at DOE's Argonne National Laboratory, will host the APS-CNM Users Meeting to be held at the laboratory from May 7 to 10. The event will kick off with updates from the DOE Office of Science, the directors of the APS and CNM, Stephen Streiffer and Supratik Guha, respectively, and Bristol-Myers Squibb's Jodi Muckelbauer, representing the Society for Science at User Research Facilities. A full agenda and information about registering can be found here. The gathering will provide users a chance to share their scientific results with their peers; participate in engaging classes, lectures and workshops in cutting-edge science; and consult with more than 60 vendors whose products and services can help augment their research. Dennis Mills, Deputy Associate Laboratory Director for Photon Sciences at the APS, said he is eager to talk to attendees about the upcoming APS upgrade and how it can better our understanding of the physical world. The project will create the world's ultimate three-dimensional microscope and enable researchers to view and manipulate matter at the atomic level to solve complex science problems across multiple disciplines. "The Users Meeting is a really great opportunity to energize everyone here at the APS," Mills said. "This is an incredibly exciting time to work at Argonne. Researchers here will be able to do great science in the coming five to 10 years. Now is the time for them to think about what kind of projects they want to complete moving forward." The APS plenary session on opening day will include lectures on the APS upgrade, new opportunities for materials science with coherent X-ray diffraction imaging and mapping the brain with X-ray microtomography, among other topics. The CNM plenary lectures will cover quantum materials for nano-optics, nanoscale catalyst design, dynamic interfaces and scanning tunneling microscopy results. "Meetings like this help encourage collaboration between facility users," said Kathleen Gregar, Associate Director of CNM User Programs & Operations. "A desired outcome from these joint user meetings is the development of new projects that are enhanced by collaboration across the two facilities." Workshops include those on the past, present and future of insertion devices at the APS, the frontiers of materials research with single-crystal total scattering and the tribology of 2-D materials from nanoscale to macroscale. Other topics include high-resolution 3-D X-ray imaging, nano-science for quantum science and applications of synchrotron X-ray techniques for studying metal additive manufacturing. The event will close with a short course offered by CNM on using the hard X-ray nanoprobe. Participants may also elect to take two additional workshops: The first is centered on micromanipulator use in diamond anvil cell loading and the second focuses on small-angle X-ray scattering software. The APS Users Organization's Rosalind Franklin Young Investigator Award, which carries with it a monetary award of $1000, and the Gopal Shenoy Excellence in Beamline Science will be announced.